There are two ways to create a quick filter for the bubble chart layer in the Excel Map: if you are Excel 2013+ user, you can create a slicer or you can create a non-standard filter based on your list. If you are an Excel 2013+ user then you are lucky – it’s really easy to create a slicer filter on a table. Because the bubble chart is connected with the Data sheet, you simply turn that sheet into a table and create a slicer. The slicer filters then the source table what makes the bubble chart show only the desired results. The problem with this filtering approach is that Excel is not showing the labels and on-click tooltip properly. That’s why you may need to check the second option for filtering the bubble chart – creating a formula filter. A formula filter approach means that you will have to create a combination of formulas to filter out the Data sheet. If you meet the conditions, the bubble gets the desired value, if not the bubble value needs to be 0. 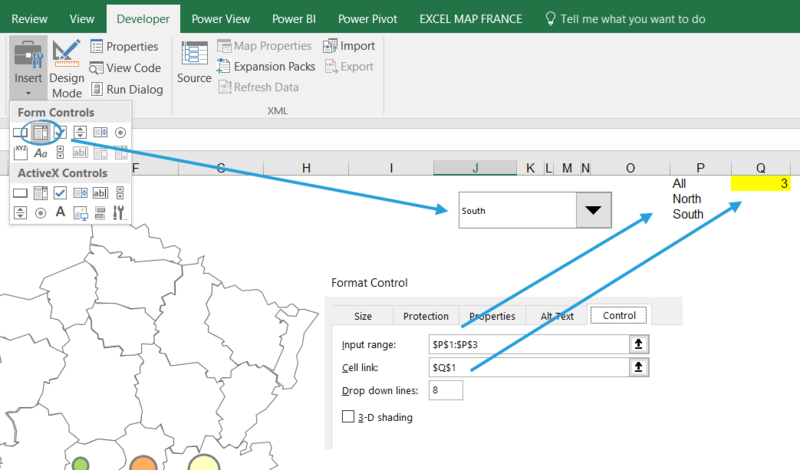 We will create a simple drop down to show values for the regions. We start with adding the combo box (drop down) from Excel’s Developer tab (if you don’t see this tab, you can edit the ribbon and make it visible). After you right click it, you can go to Control tab and connect the drop down to the input and output cells. After copying the formula to the end of my data range I can test how my drop down works. 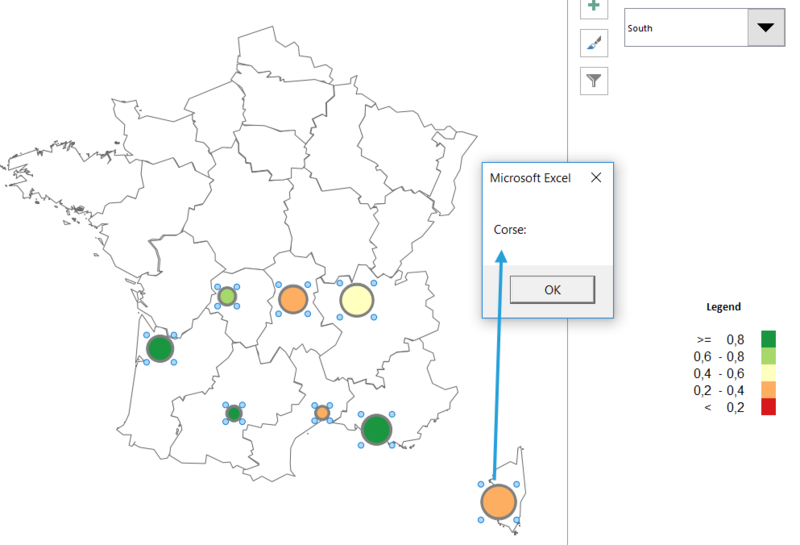 PreviousPrevious post:How to show 2 measures on the map?NextNext post:How to geocode customer addresses and show them on an Excel bubble chart?